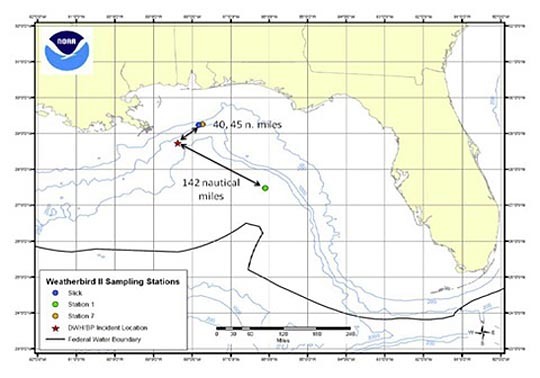 The National Oceanographic and Atmospheric Administration (NOAA) has now tested water samples from oil plumes at three sites in the Gulf of Mexico, at varying distances from the Deepwater Horizon oil spill. 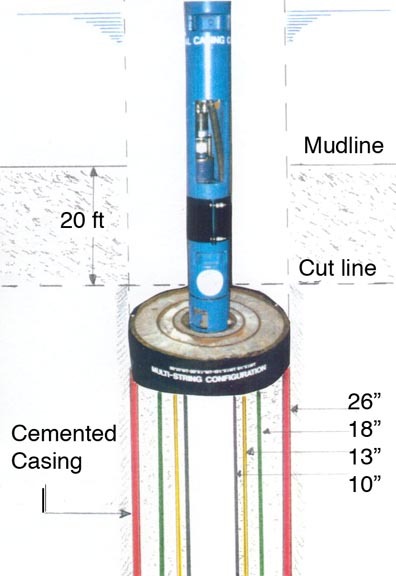 NOAA Administrator Jane Lubchenco said that the tests conducted at three sites by a University of South Florida research vessel confirmed oil as far as 3,300 feet below the surface 42 miles northeast of the well site. 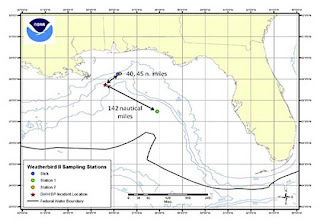 Oil also was found in a sub-surface sample 142 miles southeast of the spill, but further tests showed that oil is "not consistent" with oil from the spill. Lubchenco said the water analysis "indicate there is definitely oil sub surface. It's in very low concentrations" of less than 0.5 parts per million. Additional samples from another research vessel are being tested, she said. To place these samples in context, consider first the locations at which they were taken. 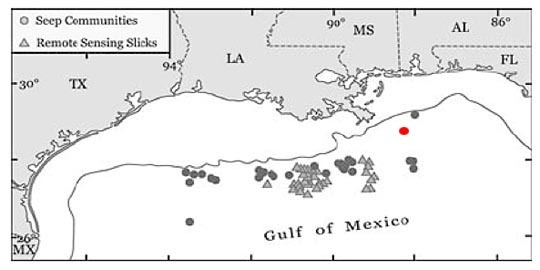 Locations of the oil sampling sites reported by NOAA The red star is the well, and the oil from the well was found at the two sites (surface and sub-sea) North of the well, while the green spot which marks the site South of the well which was contaminated with oil from another source. The oil in the southern location may potentially come from a source which also generated the tar balls on the Florida keys recently. This was the map of natural seeps that I put up the other day. It is germane to also note that the concentrations of oil in the plume are at a level of 0.5 ppm. In context that means that there is 0.5 cc (or roughly 0.4 gm) of oil in a cubic meter of seawater. This is not discernable to the naked eye. 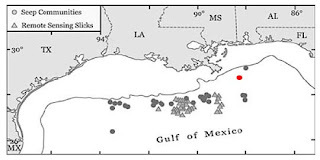 Thus when a news report (such as that from Sam Champion on the ABC World News) talks of the oil plume and shows the blobs of oil that he saw subsurface in a dive some weeks ago, it is effectively deceptive, since the correlation of the plume with that visual conveys the impression that the plume contains a high concentration of oil. In fact the water appears clear, and were this fresh water and the oil were instead Benzene, EPA would let you drink it. At this level, if it takes 3.43 grams of oxygen to biodegrade a gram of oil, then it will only require about 2.7 gms of oxygen to treat the cubic meter of seawater. Since oxygen is somewhat scarcer deeper in the ocean it may much slower that the 100 gm/cu m/day that I mentioned as the top rate in an earlier post But on the other hand it is not likely to take months. This relatively short-life for the oil after it is dispersed contrasts with the remnants of the oil that was not dispersed, in the colder waters of Alaska, after the Exxon Valdez oil spill. Remnants of that oil still remain 21 years later, and can be found as emulsions, tar balls, and trapped liquid. The suggestion by Jean-Michel Cousteau that the oil should have been left untreated, so that it could rise to the surface and be collected by skimmers, does not recognize that in many conditions skimmers are only able to collect about 15% of the oil, and that in large volumes (as with the Alaskan example) oil, once it reaches the shore, can survive for decades. Better surely to break it into small droplets that are degraded and disappear. And in that regard one of the benefits of adding Corexit to the oil is that it both breaks it into these small droplets, and that in the process it reduces their chance of floating on the surface and contaminating surface dwelling fauna. Corexit even works in cleaning marshes. In other current developments, the flow of oil from the LMRP and cap over the well, continues to increase. For the first 12 hours on June 8th (midnight to noon), approximately 7,850 barrels of oil were collected and 15.2 million cubic feet of natural gas was flared. 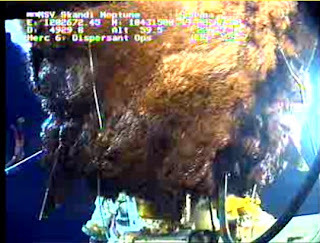 That increased flow (achieved by reducing the choke on the outflow pipe) can be seen indirectly by comparing the current picture from the Skandi ROV 2 with that earlier. The small triangular pieces at the bottom of the cap are now well clear of the plume, showing the reduced flow. As a result this increased flow is exceeding the capacity of the existing fleet sitting over the well. 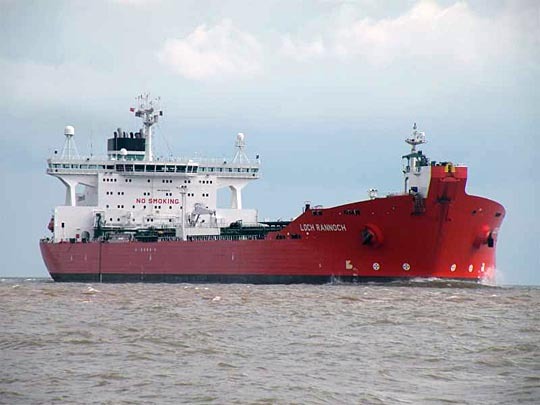 Upstream Online is reporting that as a result BP is bringing a Floating, Production Storage and Offloading (FPSO) vessel and a shuttle tanker, the Loch Rannoch, from its station off Shetland to the Gulf. (The Loch Rannoch was involved in another BP accident, a collision that stalled production at the Schiehallion field at the end of last year. “The crash happened when the 130,000 tonne tanker was docking to take oil from the 144,000 tonne BP platform for transfer to the Sullom Voe terminal, off Shetland. Its only hose-reel used for exporting the oil was damaged in the collision,” the newspaper reported. And a BP spokesman was quoted as saying that the Schiehallion FPSO was not back in production yet. (November 3rd). The Loch Rannoch is an 850,000 barrel shuttle tanker, that carried oil from the FPSO at Schiehallion to Sullom Voe in Shetland. 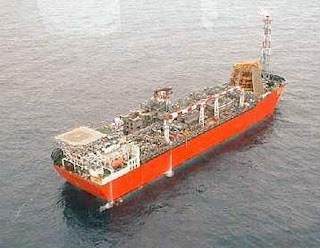 The FPSO is a different sort of vessel. This is the one at Schiehallion (And I don’t think it is coming since it still has an oilfield to service). At a top speed of 14 knots, and having left last Wednesday, with a stop in Rotterdam, it may still be a while. That will free up the drillship to move on to other things, providing they have an FPSO by then. And one last point in this series of shorter items that has filled the news today, I had mentioned using an ASJ to cut outwards from the inner pipe of a series of casings, but the illustration I gave earlier had the pipe cut from the outside. 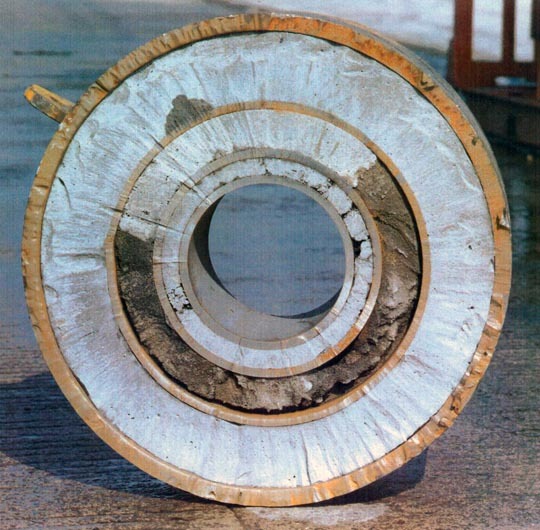 This one (the outer casing diameter is 26 inches) was cut from the inside. And this shows the relative sizes and where the cut was made. It is needed as one of the final steps in the abandonment of the well. Perhaps BP might use it when they finally abandon the well. It would be nice if we didn't have to use Corexit at all. Although the media may now be over reporting the extent of the spill, its all clear that for quite a long time BP was underestimating. In a spill this big, I'd prefer the overestimate as there is little room for error. And with the latest news regarding BP's documented response "plan", I can only think that the days of the government letting industry have a free hand in offshore drilling are over. BP screwed up. Bad. And they opened the door for a lot of criticism to their response by failing to plan for the worst.